Last time I was in Pune, I came tantalizingly close to meeting my classmate from fifth grade (thru tenth) – Ranjan Ghosh. In fact, I was close to his house meeting somebody else but his office schedule could not match up with my flight schedule. He was therefore very high on my list this time to meet. 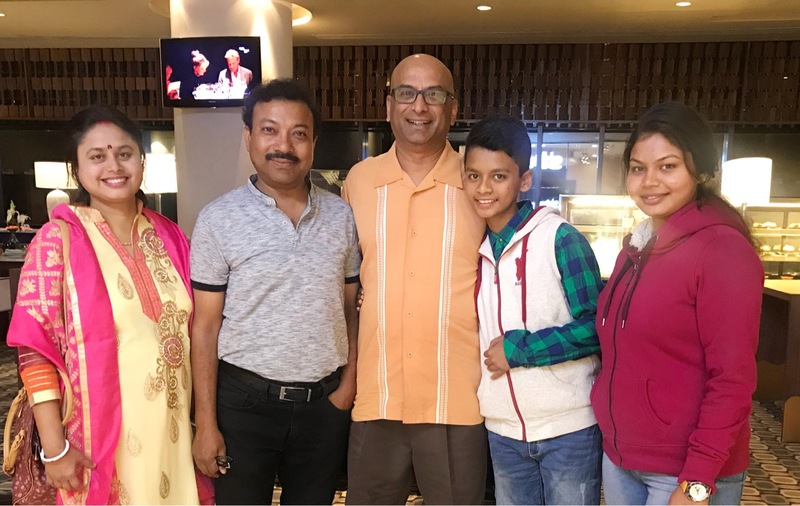 Thanks to his and his family’s graciousness – they decided to visit me in my hotel since I was dog tired after all the road travel from Mumbai and then in the Pune traffic – I had an outstanding time with the Ghosh family last evening. In a somewhat of a coincidence, his younger brother has moved to Atlanta recently and I managed to go check on him when his parents were visiting him from Durgapur a couple of months back! The last time I saw Ranjan was in 1983 – more than three and a half decades back. Funny part is that he has remained pretty much the same. The same athletic build, head full of hair, mustache and all that. I could have picked him up from a crowd any day. It was great to meet his wife Munmun. She is from Rourkela. I rattled off the names of all my friends from Rourkela hoping she would recognize somebody. Unfortunately, she is too young to know my friends. But I persisted in finding some intersection point and eventually it paid off. Turns out her younger sister is married to an ex-student of my mom. We, in fact, called up her brother-in-law Samar Sarkar and I chatted with him for some time. Sure enough, the network got thicker and thicker. He is a good friend of none other than my good old runny buddy in Atlanta – Samaresh!!! That was not the only connection. Remember Mrs. Biswas – my tenth grade English teacher? I had made my last trip to Pune to meet her. Well, a little poking and prodding and we found out that Mrs. Biswas was Ankita’s (that would be Ranjan’s daughter) English teacher and Vice Principal in school (St. Mary’s, I believe). You should have seen the look on Ranjan’s face as he realized that all these days he was oblivious to the fact that his English teacher from St. Xavier’s, Durgapur is the exact same person as his daughter’s English teacher from St. Mary’s, Pune!! How cool was that? Ranjan’s son – Ani – took a great liking to me. (Young kids can easily jump to wrong conclusions that way!) We exchanged some puzzles and riddles. Before we said goodbye, he walked up to me and said “Tumi khub interesting uncle”. (he accused me of being an interesting uncle). Now, that is something that should some strutting rights!! It was great seeing the Ghosh family from Pune!